With the release of Twilight Princess HD, many of us will once again embark on a journey into a version of Hyrule that is shrouded in darkness. And what better way to do that than with the help of the Princess of the Twilight Realm; there’s no better guide (and in my opinion, no better companion) in all of the Zelda series. Midna is one of the most inspiring female characters in the lineup. She’s strong in terms of both power and confidence, and while she’ll do anything to save herself and her people, she is loyal to anyone who can prove their worth to her. Our mischievous little Princess is full of attitude and riddled with trust issues, but she comes around, especially to Link. After the jump we’ll discuss what makes Midna the memorable and influential imp she is. 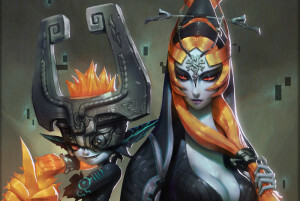 Let’s first look at Midna’s origins and the brand new culture she brought into the series: the Twili. To understand Midna we’ll have to understand where she came from, so the Twili were a group of people who wielded dark magic and were thus banished to the Twilight Realm by the Goddesses during the “Interloper War.” In the Twilight Realm, the community grew to be mostly content with their home and even admire its melancholic beauty– except for some like Zant, who were restless and dissatisfied with life there. The power of the Dark Interlopers (who predated the Twili) was mostly channeled into the Fused Shadows. But Twili royalty also possessed some of their ancestors power, not unlike the limited powers retained by the Royalty of Hyrule. rightfully the next-in-line and Midna had stolen his throne, rebelled and with the aid of Ganondorf’s power turned the Twili inhabitants into monsters. In the same instance he cursed Midna to take on the form of an imp and lose much of her power. 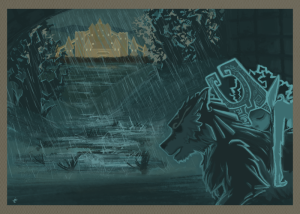 Equipped with the history of the Twili, though, Midna is able to locate the “divine beast” prophesied to save the Twilight Realm and head off to gather the Fused Shadows. That being said, Midna’s life had turned upside down almost without warning and in the process her very own body was replaced with that of an imp. This is enough to discourage any person, but not this Princess. She was determined to get her powers back and rescue her people (though she didn’t have very much care for the world of Light at the time). Even without her power or her tall and regal appearance, Midna remained intimidating and commanding. This kind of confidence is awe-inspiring, and it shows the cunning and intelligence that earned her the title of “ruler” in the Twilight Realm. I mean can you imagine being turned on by one of your own? Overthrown by some insane man-child like Zant!? I would’ve been either devastated or irate beyond belief. But Midna was never down-and-out nor acted irrationally out of anger, she considered all her options, made a plan, and got to work. She’s no-nonsense and she usually doesn’t care who she has to hurt to get what she wants. This leads me to Midna’s trust issues. As a leader, especially one who has just been rebelled against, trust isn’t something she’d be wise to readily give away; so again we can see her political prowess shine through. We also see her culture come through, as she doesn’t care about the World of Light and questions Zelda’s authority and ability to lead. Knowing her people were banished to the Twilight by the Goddesses– who are tied to the World of Light and most closely to the Royals of Hyrule– Midna maintains a negative opinion toward Zelda and remarks that she likes the look of Twilight over Hyrule. It is not initially Midna’s plan to save the Light World, it’s just a side effect of her main objective to find the Fused Shadows and defeat Zant. On the subject of lacking trust, Midna doesn’t reveal her plan or her true identity as the Twilight Princess to Link at the start of their collaboration. While she helps him get somewhat acclimated to life as a wolf, he is genuinely just her tool for the longest time. She manipulates him to get him to go through the Forest Temple by lying about the children from Ordon likely being there. Her whole conversation with Link before the Forest Temple is very manipulative, “…maybe you’d rather just wander as a spirit like the rest of them, totally unaware of what was happening for all eternity… right?” “Do you want to head to that temple? Well isn’t that convenient! I was just heading there myself.” “Hey, look… You want to help your friends, right?” “Well, good luck, Mr. Important Hero!” She makes the whole thing seem like his idea while belittling him slightly in the process. Again, she’s a smart politician and negotiator who knows how to get what she wants, but at the start she doesn’t care for Link at all. The turning point for her character emotionally (and in terms of trust) is “Midna’s Desperate Hour.” Once Link and Midna find the three Fused Shadows, Zant confronts them in Lanayru Spring. Link turns back into a wolf, and Zant uses his powers to keep Midna bound so that he can taunt her, call her a traitor, and refer to himself as King. So rude. But just when he’s about to hurl some plasma-ball of Twilight at Midna, Link steps it. Link is a caring individual, so despite the somewhat nasty way Midna had treated him, he lept to protect her from Zant. While he doesn’t help much, I think that was a defining moment in their relationship. And Midna refuses to help Zant destroy the World of Light shortly thereafter (not that she would’ve helped him regardless, but her respect for those who live in the Light definitely grows here). Unfortunately, Zant bathes Midna in the Light and she, well, let’s just say if your color scheme inverts you really aren’t doing too hot. Weakened and on the brink of death, Link brings Midna to Hyrule Castle. And rather than be worried about saving herself, as she would’ve been at the start of the game, Midna is more concerned with how to save Link from being stuck in wolf form forever! Toward the end of their conversation with Zelda, Midna asks the Princess to tell Link where the Mirror of Twilight is. She trusts Link to carry on with her task once she passes; she trusts him with the fate of her people. Now that’sTwilight Princess is the only way to feel the full force of this shift in their dynamic. Midna’s selflessness here doesn’t go over Zelda’s head, and our ever benevolent Princess decides to sacrifices her spirit to allow Midna to continue her journey with Link. And once again there’s a relationship shift, one of mutual respect and understanding between Princesses. Given her new lease on life, Midna and Link together make their way to the Twilight Realm. It’s a bittersweet trip. 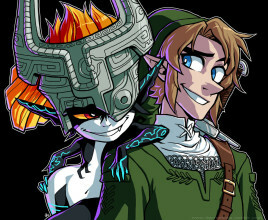 Arriving there, Midna says to Link, “Can I ask you one last selfish favor? Regardless of what my reasons may have been, I once abandoned this world… I left behind the Twili. Those who had followed me, those who considered me their ruler… Even now, as they remain here, suffering, they believe that help will come for this world… But if they were to see that the only help for them was a hideous little imp, don’t you think they’d feel let down?” She acknowledges that she has been selfish in asking Link for favors, referring back to her having used him earlier. But not only does she somewhat apologize to Link in her statement, she also reveals that her cockiness was a ruse. She’s being very modest and showing weakness and uncertainty in her actions for one of the first times; this gives her even more of a human quality, because she isn’t perfect and she too can feel inadequate. This quote also shows her utmost concern for the Twili in her tribe, and her understanding of their need for hope. As Link and Midna fight their way through the Palace of Twilight, they gradually restore the forms of the Twili using the power of the Sols– and I know that their relationship grew ever stronger for this. Now we come to the “sacrifice” bit of her character. When Midna doesn’t turn back into her true form after defeating Zant, she’s a understandably upset. But she channels her frustration into using the Fused Shadows to break down the barrier around Hyrule Castle– and her later attempt to defeat Ganondorf. She knows that fighting Ganondorf may very well lead to her demise, but she accepts it, and she warps Link and Zelda out so that they can’t get caught in the crossfire or risk their lives trying to interfere. The crazy thing is, Midna actually does die! But her sacrifices for the Light World saved her in the end, as ironically the Princess of Twilight was resurrected by the Spirits of Light. 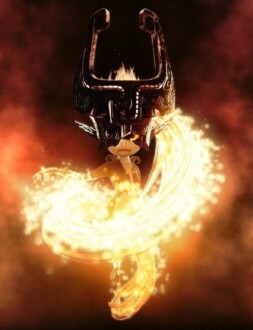 And this moment is the big reveal, when we finally get to see Midna’s true form in all of her glory. During the events of Twilight Princess, Midna went through a lot. Her appearance, her throne, her life, and her people were all put in jeopardy. Seeing her true form signified the end of her struggle, the beginning of her life’s return to normalcy and the balance of Light and Twilight being restored. And to make sure that this balance stood, Midna made one more daring sacrifice. She destroyed the Mirror of Twilight. It was painful for her, leaving Link after such a long and rather intimate journey must’ve been extremely difficult. But true to herself, she does what must be done no matter how tough, and this time her action was done not only to protect the Twilight, but also the Light. Midna’s valor is commendable throughout Twilight Princess, but her development as a character is one of the most realistic I’ve come across. It was gradual and unfolded so perfectly as the game went on. I admire Midna, I played Twilight Princess during a rather challenging year of my life but I found strength in Midna’s confidence and tenacity– and I hope that gamers introduced to her with Twilight Princess HD will be able to do the same.